Today will be a day which will be permanently etched in the memories of all Buenos Aires citizens . It was independence day which has very special significance and is a national holiday for all Argentina. 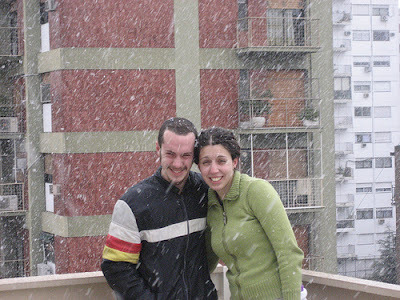 The night before I felt very strongly it would snow here in Buenos Aires and remarked this to a few friends who laughed at the idea. It has been a exceptionally cold winter with record low temperatures. The situation has been exacerbated by the energy shortages which has caused the Argentinian government a loss of its support. Monday the 9th of July 2007 started bitterly cold . I woke up shivering in the sub zero temperatures . The night before the beautiful city of Bariloche suffered its coldest night ever with temperatures of -20 degrees celcius. The streets were eerily quiet with hardly a soul in Palermo Soho as the cold scared away even the most avid visitor to this famous barrio. Around 3pm with a great need of eating something I joined a friend to have a holiday lunch at my favourite restaurant in the world - La Cabrera. Within minutes of sitting in this magical restaurant I noticed a flurry of snowflakes painting the sky a gorgeous white . It truly was, for us who live and love this city, a magical moment. It was like seeing snow in Sydney Australia , or Los Angeles, California. The snow enchanted us all, and in the eyes of the older women and men here I could see a return to the fascination of childhood as they took in the increduluos scenes around them. It seemed that everyone was rejoicing in this historic moment. Gone if only for the moment were all the cares of the world: no thoughts of the upcoming election, or work....... just joy at the precious and historic scene. The streets were full of tremendous scenes of laughing families, stunned tourists, and people clicking away hoping to catch every second before the snow melted away. But the snow lasted for 8 full hours and at midnight around Plaza Guemes in Palermo there were kids making snow men and throwing snowballs in the shimmering Antartic night. It’s really great post. I would like to appreciate your work and would like to tell to my friends. 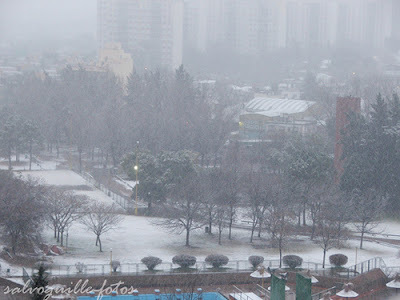 It is true, it never snows in the capital so it was a big surprise. I had a Buenos Aires rent that day and I saw everything through the window of my apartment that was in front of the botanical garden. It was nice to see people who had never seen the snow play with it can comment it with friends as if it was amazing! Very nice post. I simply stumbled upon your weblog and wanted to mention that I actually have very enjoyed browsing your diary posts. In any case i will be able to be subscribing to your feed and that i hope you write once more terribly soon! Hi there, I would like to chat to you about a Greek TV show that will be shooting in Argentina in January 2015. Are you able to send me your email or mail me to discuss further?